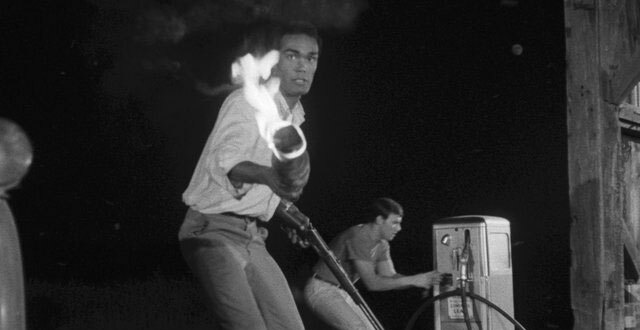 On Feb. 13, just in time for Valentine’s Day, the Criterion Channel on FilmStruck debuted “Night of the Living Dead,” George A. Romero’s 1968 horror classic. The posting is notable for several reasons. For one thing, if you stream a lot of video, you know that “Night of the Living Dead” is everywhere. There are three versions, including a colorized one, free to Amazon Prime members. So you may well ask why the FilmStruck/Criterion Channel offering is a big deal. It’s because the version appearing on the site is a new restoration from the film’s original negative, produced by the Film Foundation (the preservation nonprofit founded by the director Martin Scorsese) and the Museum of Modern Art, which put “Night of the Living Dead” in its permanent collection. The restored film was shown in November 2016 at MoMA and later in repertory and art house theaters all over the country. Some skeptics online who haven’t seen the restoration ask “how good can the new version look?” After all, “Living Dead” is one of the original low-budget horror movies that morphed into a classic. The answer lies in part with just how bad the versions you can watch on Amazon Prime look. There’s one with a “Fisher Klingenstein Films” logo before the opening shot. The image is blurry, with the whites far too bright, washed-out and lacking in detail. A “50th Anniversary” edition, touting the movie as “Now Available in 1080p High-Definition-2K HD transfer from a rare film print” may well be as advertised. Yet however “rare” the print from which the version was scanned, it wasn’t in very good shape. A lot of scratches and blotches, and overly high contrasts that deepen the blacks into nothingness while distorting the whites. We shall not even speak of the colorized version. These various iterations exist because the movie’s original distributor failed to copyright it. Once it went into the public domain, anyone with a print of the movie could distribute it anywhere, produce video versions, and more, free. The creators of the movie didn’t make any money. The Film Foundation and MoMA allowed Image Ten, the original company behind the film, founded by the director, Mr. Romero, the producing brothers Gary and Russell Streiner, and the writer John Russo, among others, to register a copyright for this restoration. And Janus Films and its sister company Criterion licensed the movie from Image Ten. So this is the only edition of the film that yields revenue to all its original creators. And it does, in fact, look amazing. “Night of the Living Dead” broke new horror ground with its story of a group of strangers trying to work together to fend off a mysterious attack by risen corpses determined to feast on the living. Its influence is felt on just about every zombie movie since. Yes, it was a low-budget picture, but it was made by artists who knew what they were doing. On a recent viewing of the restoration, I was able to spot it — although for a while I didn’t think I would, so engrossed was I, even after probably dozens of viewings. I won’t reveal its exact whereabouts, except to say it’s after the movie’s 75-minute mark. expounding on the movie’s influence. You can also watch “Night of Anubis,” a 16-millimeter “work print” of “Living Dead” under a different title. It’s raggedy looking and only minimally different in content to the finished film, but it’s of interest to fans who want to peer into the filmmakers’ process; Russell Streiner, one of the film’s producers, who also plays the memorable role of Johnny, who has the car keys, gives a thorough introduction to the supplement. So yes — the FilmStruck/Criterion Channel “Night of the Living Dead” is the one to see. And it is, in the parlance of Criterion, “director approved” — Mr. Romero, who died in July 2017, did sign off on this version. You will not be disappointed to see the movie as he intended. A version of this article appears in print on February 18, 2018, on Page AR14 of the New York edition with the headline: George Romero’s Vintage Zombies Are Resurrected.